They say that April is the cruellest month, but so far I've got to say that it only seems like the FASTEST month! I can't believe we're all ready half-way through. This month is faster than a...hmmm...what metaphor could I use? 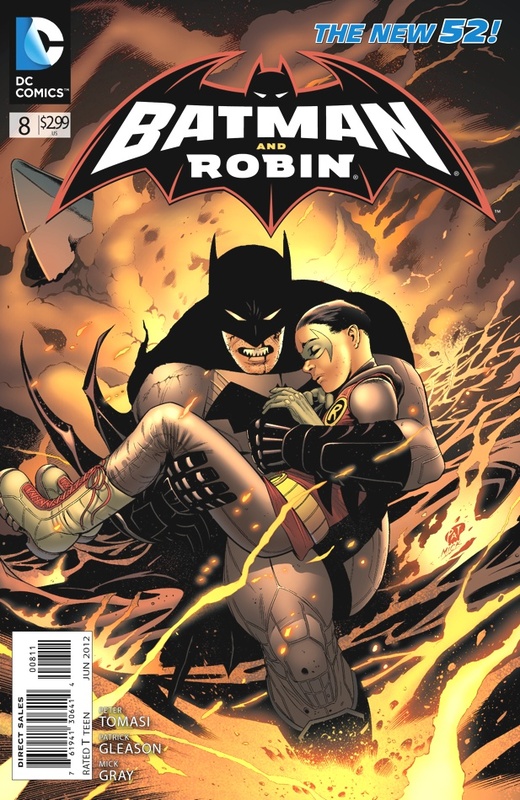 Batman And Robin #8 - This is an issue of Batman and Robin where both very little and a great deal happen. Bruce and Damien both have to deal with the horrible aftermath of their battle with Nobody last month, and the toll it has taken, both physically and mentally, on each of them. Upon return to the batcave, Alfred puts them both on house arrest due to each suffering concussions, multiple fractures, etc. So Batman and Robin don't fight any criminals this issue. They don't solve any mysteries or hunt for any clues. Rather, they have a heart-to-heart about what it means to be a member of the Wayne family, a member of the Bat family, and at the end of the day, what it means to be a human being in a world that would rather kick you when you're down than give you a helping hand back up. Then they play fetch with Bat-Dog. His name is Titus by the way. He slobbers a lot. 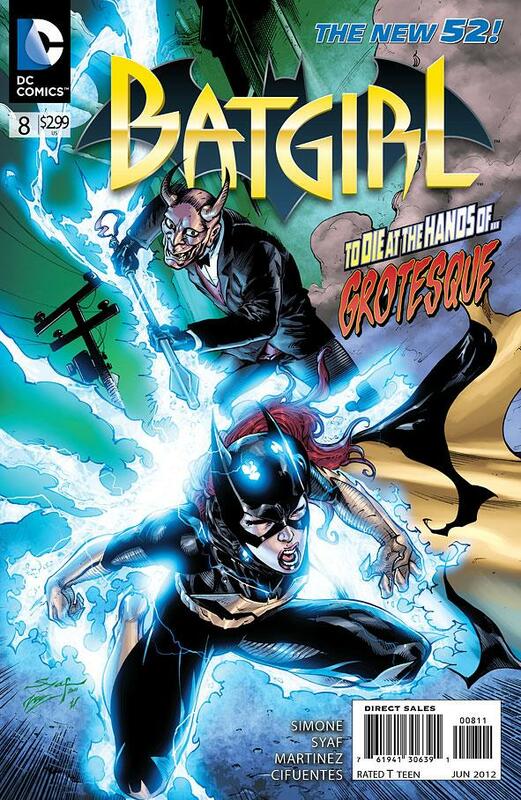 So if you like characterization, you'll like this issue, with insights into the minds of Bruce, Damien AND even Alfred. If you'd rather see the Riddler or Killer Croc or someone get punched in the face a lot, this probably isn't the issue for you. Personally, while I'm all for comic-book face-punching, I still loved Batman and Robin #8! Batgirl, Green Lantern and more after the JUMP! ...Ok? So instead of pummelling the aforementioned goon, Batgirl subdues him but then lets him go?? Huh? Well, it turns out that there's a good reason for this...I'm not gonna spoil it though! In other news, Barbara briefly visits her mother in crazy-town yet again, as she tries to make sense of her various traumas. No wonder this girl likes to dress up as a bat and hit people! Her life is messed up! Batgirl's mom reveals that she left to "protect" the family from her little brother, James Jr. This may be old news to all but me, but it turns out baby brother is a serial killer! Good thing he's locked up safe in Arkham Asylum, right? No one ever escapes from Arkham, right? Right??? Green Lantern #8 - Sinestro and Hal are being held prisoner on an unknown planet by The Indigo Tribe! Apparently they have rings which can access the powers of any of the colour/emotion spectrum and they're trying to convert Sinestro to work for them! He doesn't seem too thrilled by the concept. Hal, meanwhile, does manage to trick his guard, a being called Black Hand, sort-of charge his ring a little bit and rally to try and rescue Sinestro and get out of there! It doesn't look like he has that great of a chance though. The place he is locked up in is HUGE! Coruscant-like, even! It was fun to see what sort of moves Lantern will try to pull when his ring isn't being particularly reliable...gets him out of his comfort zone! Suicide Squad #8 - Right off the bat (no pun intended!) lets answer the question on everyone's mind. Last month, Deadshot shot Harley Quinn in the gut and took her out. This month, she is....dum dum dummmmm...ALIVE! Just barely, of course, and helped along by being injected with some bright green drug labelled "LZRS-017" by government agent Amanda Waller. Researched by Ra's Al-Ghul perhaps? I mean, LZRS - Lazarus...couldn't be co-incidental could it? Of course we may never know as the issue then switches gears. This whole issue is a bit of down-time for the team, who aren't sent anywhere till the very end. We get a little visit with each member independently and we also get teased as to what the next story line might be. 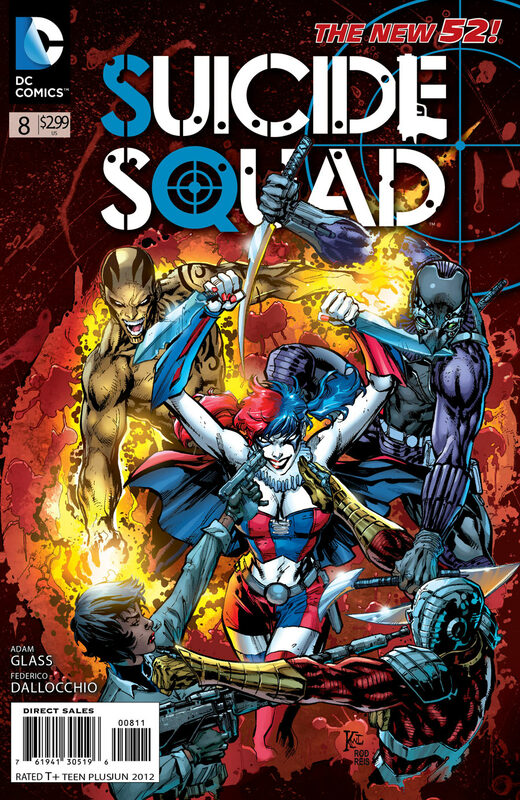 Looks like one of the original Squad members (Deadshot, Harley, El Diablo, King Shark and Black Spider) is a plant by an agency known as Basilisk who's goal (in this case) seems to be to assassinate Amanda Waller and probably the rest of the Squad along with her! Of course we don't find out who the mole is yet! Don't be ridiculous! My money's on Black Spider but it's a pure guess...could be anyone! Stay Tuned! 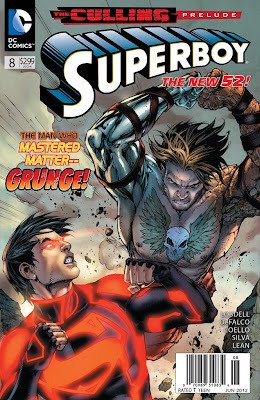 Superboy #8 - Superboy has been taken prisoner by N.O.W.H.E.R.E. 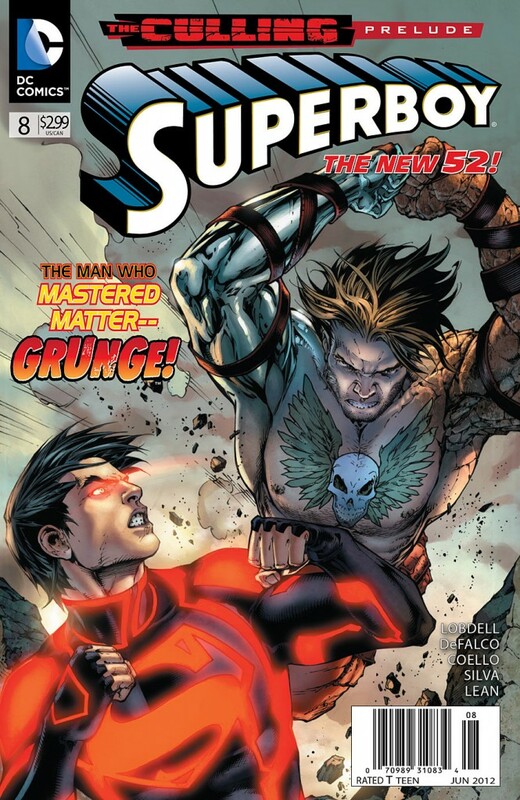 and is being forced to fight a meta-morph named "Grunge" (must be a Nirvana fan) in a centurion-style fight to the death as a prelude to something called "The Culling". 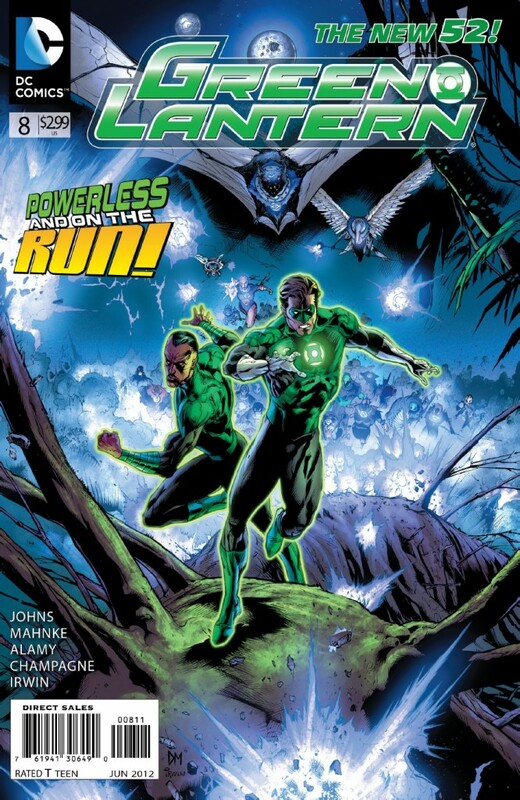 It's gonna be a big cross-over between this book, Teen Titans and Legion Lost. It will also tie into new book The Ravagers. I've never read Legion Lost but I understand it features Rose Wilson, the teen girl/metahuman assassin (possibly also known as Ravager?) that was supposed to be showcased in this issue fighting Wonder Girl! At least, that's what Teen Titans #7 promised!! Sadly, they lied. Still, this was a good issue. I'm short-changing the Grunge fight...it was pretty cool. Especially the end! We also learn a bit more about Harvest (head honcho of N.O.W.H.E.R.E.). What he wants and why N.O.W.H.E.R.E. exists...stuff like that. Not a LOT of information mind you, but a little more than we knew last month. Why does Harvest want teens to fight to the death? Hmmm. I'm sure if I looked like an extra from the movie Hellraiser I'd probably want to make people fight to their deaths too. What else are you gonna do, sell used cars? Oh of note, Solstice of Teen Titans makes a guest appearance (you may recall she had a major falling out with Red Robin in Teen Titans last month), as do two others that I believe have never been seen in the New 52. If you are a fan of the OLD Teen Titans I suspect you'd recognize them though! One isn't nearly as GREEN as he used to be. Anyway, since this appearance is on the LAST page, I won't spoil it anymore than I just did, but I'm psyched for the next issue! Bring on The Culling!! For "once the Culling begins, EVERYONE is an ENEMY!!" And that's that for another week! Tomorrow's the BIG new comic day for me, so strap in! Nightwing and Batman have prelude issues to "Night of the Owls" and of course there's Justice League, Wonder Woman and a bunch more! Oh right and as always, see what I'm thinking about (ASIDE from comic books) at Stryder's Dementia! Have a good one!